I was walking up and down in drunken pride. By the company he chooses,"
And, with that, the pig got up walked away. The song is known generally as "The Pig and the Inebriate," and there are many variants, including one -- "The Famous Pig Song" -- which goes on in later stanzas to include quite a few other animals. 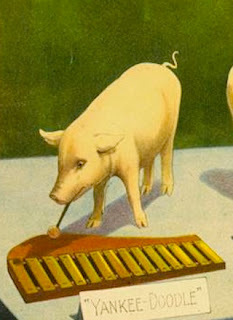 The belief that Pigs, simply because they appreciate the cooling properties of some lovely clean Mud, are therefore inured to any sort of Refuse, or even love to Gambol in Faeces or Garbage, has such wide circulation among Humans that we could scarce dissuade them from it if we Could speak. As ever to resume that happy state! We are in a mood, to wallow in our food! And yet he's just as nice as you (or even me). There's nothing cuter than a pig! I'm sure that Toby would forgive any mild imputations of bad character in so lighthearted a song, especially given its positive conclusion. But perhaps one of the finest -- and the saddest -- songs about pigs is one which touches very nearly on Toby's story; this is the Tiger Lilies' mournful ditty, "The Learned Pig," with libretto by the brilliant Edward Gorey. This pig, born at "the turn of the last century," is exhibited at a fairground on a bucket and forced to answer "stupid questions in a profound manner." Surely something of Toby's original story is at work here, although alas this pig meets a much harsher, and sudden end, than did Toby.